Last year was the 10 year celebration of South Africa’s Truth and Reconciliation Commission (TRC). For me as a white Afrikaner woman and psychologist the challenge these past ten years has been one of finding ways to participate in the healing of our society – ways in which I could do restitution for my part in the oppression. I take responsibility for being a partially aware participant and beneficiary of a system of violent oppression of black people in South Africa. For many years I struggled to make sense of my own position of living happily within a society where so much evil and trauma was happening. I have found the grid on witness positions developed by Kaethe Weingarten extremely useful in making sense of my life within the South African context. 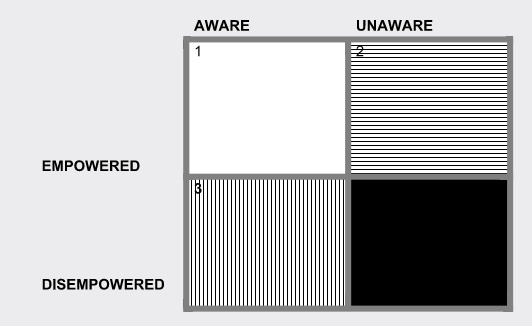 A typology of witnessing developed by Kaethe Weingarten, author of Common Shock: Witnessing violence every day, how we are harmed, how we can heal Dutton, New York 2000. I grew up on an apple farm in a very privileged family and as a white child my contact with black people was limited to people who served my family as farm labourers and domestic workers. I never questioned why only white children attended our school and church or visited the beaches that we went to. Apartheid was truly successful in keeping me apart from the other. I was taught to understand my world according to very simple principals of “this is just how things are” – some have and others don’t, white people belonged here, black people belong there. Although it is hard to believe, even for me, I grew up mostly unaware of what was happening around me. As a young child, I had limited power to change much of it. After school I studied psychology and in the 80’s opened a private practice in Somerset West 40 km outside of Cape Town in the wine lands district where I still live and work. My practice did extremely well; I took in a second colleague after 2 years and another 2 years later a third psychologist joined my practice. I was a popular public speaker who gave talks, mostly in the privileged white community as those were also the people who had access to my practice. Still I suffered from tunnel vision. I had positioned myself so successfully as an expert whom everyone consulted about their problems that I started feeling alienated from others and I remember distinctly having a strong sense of alienation from myself. I consulted a therapist and told her that I felt as if I had this huge and impressive exterior to which others responded, but inside I felt small and empty. I definitely experienced myself as a fake who was just waiting to be caught out!! An even more painful reality was when I recognised the many ways in which I, as a white South African, has benefited from the pain, oppression, injustice and suffering of black people in this country. I realised the extent to which my people and my church was responsible for abusing the Word of God to justify this evil system. I experienced despair at the lies that I had been fed all my life and the way in which I willingly and happily swallowed it, because it suited me so well. As I listened to the stories that people were telling to the TRC and as I started making it my business to befriend and participate actively with black colleagues by inviting them to share their personal pain and the hardships they had suffered I became more and more confused and over-whelmed. In 1997 I was diagnosed with a major depressive episode and eventually decided to leave my practice. I experienced intense guilt, pain, despair, helplessness and symptoms of depression and burn-out. It is terrible to know and not to be able to do anything about it!! Once you know you cannot pretend to be naïve and not-knowing – o, how I sometimes longed to be back where I was unaware and happy in my fools paradise!!! I was forced to take two years off and in this time I recovered and rested, retrained and repositioned myself as therapist within the South African context. Narrative therapy offered me an opportunity to do some re-training so that when I went back to work I was able to take the socio-political and contextual into account when seeking to participate in the healing of people. I have moved my practice to my house to keep over-heads down. This enables me to donate time and participate with communities by going out to them. I have experienced significant healing in becoming an aware and empowered witness in my community. I will discuss my participation in responding to one of the most serious traumas in our country – HIV/AIDS. Everyday between eight and six hundred people die of AIDS in South Africa. The enormity of the pandemic has been trivialised, misunderstood and mismanaged by many people in positions of power. This has had devastating consequences for those affected and infected. At the Drakenstein Hospice the staff provides palliative care for dying patients as well as care for patients with incurable illness. Many of these are people living with HIV/AIDS, often in conditions of extreme poverty. I have been involved in the training of the first staff and volunteers of this Hospice in 1991. I have seen it grow from a NGO that provided care mainly to middle-class cancer patients to an organisation with a Care Team consisting of a nursing manager, 5 professional nurses, 2 social workers and 18 palliative home based care workers. In addition the work is supported by over 70 volunteers. My connection was strengthened in 2001 when Elizabeth Scrimgeour, present Chief Executive Officer, and Fran Tong, head of psychosocial serves, were students in a Masters course where I taught and supervised them in narrative practices. In 2003 I was approached to do monthly “de-briefing” sessions with the nursing and psycho-social team of the Hospice. At the time the work with the HIV/AIDS patients was exploding and the staff was not able to meet the demands in the wider community as they started making their services known and accessible to more people. The Board, management and some staff members at the time had difficulty in making the shift to accept that the services of the Hospice was expanding to include AIDS patients. We started the meetings with 3 nursing staff and one social worker and today this team consists of nine staff-members. In the monthly meetings I interview staff members in the presence of the rest of the group. By maintaining a non-judgemental position a climate that is conducive to what Johnella Bird calls “uncensored speaking” is supported. The content of our discussions vary tremendously ranging from personal challenges that impact the lives of staff members, to organizational difficulties, to tellings of particularly difficult, traumatic or encouraging experiences in the course of their work with patients and their families. The mood shifts from light and humorous to very, very heavy, serious and sad at times. My job is to listen attentively, to ask curious questions and to scribe the responses of group members. I invite reflections from the rest of the group according to the guidelines that Michael White gives namely to identify the expression, describe the image, embodying responses and acknowledging transport. When one staff member had been listened to and had received some reflections from the rest of the group we move onto the next person. Staff members would often encourage one another to speak about distressing situations or responses that they had noticed at work. On a few occasions I have written letters to the staff team in which I summarized the sessions and also added my reflections. These letters have become valuable documents to refer back to and are powerful testimonies to the work that the staff team is involved in and its effect on their lives. In one of these letters I reflected on the staff’s concern that they were not responding adequately to the needs of the increasing number of children whose lives were affected by HIV/AIDS. I remember the distress and tears of Marianne, one nursing sister who told us how she had to remove the children from the Mini-bus as they could not be accommodated at the Day Care. One day the team walked into our meeting looking down, frustrated and even angry. They expressed their unhappiness and frustration with a new Performance Appraisal system that was being implemented. I explored their response to the Performance Appraisal and it became clear that they felt that the items on this form spoke of medical competence only. They regarded this very thin description of the work that they do almost as an insult. I asked what they would have wanted to see on the appraisal. They spoke about the practices of care and the values that inform respectful engagement with the people that they work with as well as the relationship values that support their work as a team. I questioned them about the details of these values and encouraged them to give voice and find language for what it was that they would want to see on the performance appraisal. We got the flip chart out and started making a list. The group got more and more energized as we worked and left the session with big smiles and the flip chart list which Elizabeth used to devise the Acknowledging of Caring Practices in Staff form (Appendix A – to read in the presentation). My position as an outsider to the everyday work at Drakenstein Hospice, but a consistent witness and audience to their work is extremely valuable. In that position I hold memories of some of the solution knowledges, past successes, expressed values and progress over time that staff members often loose sight of as they get involved with their over-whelming and challenging work. I often remind them about these hopeful events from the past by questioning them about it or reading out from some of the notes or using a timeline to explore the progress. We sometimes use the sessions to brain-storm ideas of how to celebrate small joys or mark special occasions. I remember one year when the staff felt quite over-whelmed by the number of deaths that they had to deal with on top of not feeling appreciated by the Board of the Hospice at the time. I assisted the team, by prompting tellings from the notes of the previous year, to re-member some of the hopeful and encouraging moments and events that they had spoken of that year. We came up with an idea for an end of the year celebration that could expand these hopeful tellings. It was decided to that they would darken the room and put out glow-in-the dark stars. Volunteers, staff members and other participant were invited to take a star and stick it to the wall while they expressed (out loud if they prefer) thanks for anything in the year that they felt pleased or grateful for. The response was over-whelming and a powerful reminder of why the staff chooses to be involved in the work and what it does contribute to lives of the people of their community. I am constantly working to extend my witnessing so that I will expand my position as an Aware witness to the context of the everyday experiences of the Hospice staff as well as the structure of the organization that they work for. It is only with raised awareness that I can give empowered responses. With limited funds, a shortage of trained nurses, but rising number of people reporting with HIV/AIDS a system of home-based care workers was implemented. This meant that people from the communities that were served who would otherwise be unemployed were trained in basic nursing and counseling skills and appointed to do home-visits to assist with basic care. In that way they support the work of the nursing staff and social workers. This group also knows the cultural and religious values of the communities and the Hospice considers them to be their ‘cultural consultants’ in terms of their understanding and experience in this respect. For most of them this training means education that they would otherwise never receive and also skills to respond to the needs of their communities in an empowered way. I assisted in with this group’s initial training. Elizabeth asked me to be the speaker at the AGM last year. I saw this as an opportunity to raise the awareness of sponsors and board members for struggles that the staff face and the trauma that they witness everyday. I asked the permission of the staff to read a letter that I wrote after one of the staff groups – it reflects the heart of the work, the spirit in which it is done, how staff members support one another and the effect of the work on the staff. This telling in front of an audience made the staff feel honored. Afterwards Board members and members of the public said that they were moved by the level of dedication and commitment despite the struggles that the staff face every day. My life has been changed through my active witnessing of the work of the Drakenstein Hospice team. I can no longer say that I do not know. I drive past the townships and see the shacks and have clear pictures in my mind of the people who live there because I have now met some of them. I cannot pretend that I do not know the devastating effects of poverty, the despair of unemployment, the shame of illiteracy, the destruction of illness and the injuries and horror of racism where people were treated as second class citizens for generations. My awareness is raised all the time and the appeal to be an empowered witness continues to challenge me. I have also found some healing for the burden of guilt and shame that I carry as white Afrikaner. I have learnt about survival and caring skills that sometime take my breath away. I have grown in hope, the hope that is possible when responsibilities are shared, when people open their hearts, when we are prepared to become aware and respond in empowered ways. In October 2005 a group of 20 staff members from the Family Counselling Office in Trondheim, Norway visited Cape Town to attend a workshop with me. This visit took place on the initiative of Anthony Hawke, ex-South African psychologist, who had been living and working in Norway for 20 years. Although I shared some of the work that I do as practitioner in my middle-class private practise I felt I would like to take them out to meet some of the people who work in impoverished communities as that represent the services to the majority of the South African population. Part of the group went out to a school in a rural area and the larger part of the Trondheim group visited Drakenstein Hospice. Three colleagues from Trondheim make their contribution by sharing their experiences. I used the grid of Kaethe Weingarten in preparation of the visit to Drakenstein Hospice. I emphasized that poverty and illness is a global responsibility and warned the group that they will be made aware witnesses through their visit. We also spoke about possible ways in which they could respond as empowered witnesses. The group was given an orientation to Drakenstein on power-point by Elizabeth Scrimgeour. Elizabeth mentioned the latest dream of the Hospice (at that stage she had not even shared the dream with the Board!) namely a Day Care Centre in Fairyland, an informal settlement in the township, where care can be given to the more than 40 children who are infected or affected by HIV. She warned the group that they would have to be very sure that they want to become aware witnesses as that position would bring with it a need to respond. She emphasised that giving money is often an easy response. We split up into groups to visit the homes of patients together with staff members. During a visit to the Day Care the group brought out their surprise – they sang Nkosi Sikilele Africa which they practiced before coming to South Africa – to the great delight of the staff, volunteers and patients. We met together as a group for lunch with the staff and shared our experiences – the Trondheim group was over-whelmed by what they had seen and heard. Their re-tellings were very honouring of the people that they had met and spoke of life changing experiences for themselves. The next day at the International Convention Centre in Cape Town I asked the group to split up into smaller groups and to think about a hopeful moment that they encountered the previous day. I did not need much understanding of Norwegian to witness what was happening as hands, bodies, faces and the tone of voices spoke clearly! I was touched by the rich tellings and reflections that came back to me on email about how the Trondheim group’s lives had been changed through the witnessing. Through this telling you have become aware witnesses, part of our community. Please think of ways in which you can respond as empowered witnesses to do hope with us. A letter or email, maybe a visit to us could be such a way of doing hope with us.